As you well know, we’re book lovers around here. But we rarely pay full price for books. In fact, usually when we buy books, we get them for pennies on the dollar — mostly by buying them used. If you’re planning to purchase a book for yourself on Amazon, always check for the price of buying a used copy versus a new copy. If the book has been out for a few years, chances are that you’ll be able to find a used copy for less than $0.01. All you’ll have to pay is a few dollars for shipping! Note: Don’t forget to sign up for Swagbucks so you can earn free Amazon gift cards toward more books. You can really stretch the gift cards when you buy used books! You never know what you’re going to find at Dollar Tree, but I’ve come across a few really great titles over the years. So I recommend always scanning the bookshelves at Dollar Tree when you’re in there. Paying just $1 for a brand-new book — especially if it’s a title you’ve been hoping to read — can be a great bargain! You can also check Barnes & Noble’s Marketplace for good deals on used books. You can get a copy of many different used books for around $5 shipped — which is typically 50% to 75% off the price of buying new. Note: Be sure to order through Ebates so that you’ll get cashback on your purchase! I haven’t had as great success at finding really amazing books at thrift stores, but I know many of my friends have. So maybe I’m just going to the wrong stores or at the wrong times?! I love swapping books through PaperBackSwap. I recommend adding books you want to your wishlist, as this is the way I’ve had the most success in getting copies of books. Sometimes I’ve had to wait a year or two, but it was worth it since it saved so much money! Note: For more tips on using PaperBackSwap, be sure to read this article. The favorite of all us book lovers! Used Book Sales are a goldmine of good deals. But if you want to get the best deals, you need to have a plan of action. This article outlines a lot of great suggestions for maximizing the mileage of your money at used book sales. Check out my article on 5 Ways to Get Books for Free. Also, don’t forget that you can download a variety of books for free each week through Amazon.com. If you don’t have a Kindle, you can download the Kindle app to your device or PC and read the books for free. What are your favorite ways to find deals on used books? I’d love to hear! « How a simple tweet praising a company resulted in a $250 gift card! I save money by not buying books at all. I borrow them from my library. When my high schoolers are assigned novels to get for their English class’ reading, I just get them from the library. (The teachers are fine with it.) That way, I don’t have to worry about storing a lot of books or passing them along. I agree. I read about 200 books a year and I haven’t bought one in many years. I think I did buy 5 books during high school for my dd as they weren’t available in our system. Crystal, I do have to admit that I bought your ebook when it was on sale for 99¢. I paid with it through Swagbucks, so that doesn’t really count, does it? I second this! I read lots of books and so do my kids, but we get them all from the library. If there is a book that I want to read that they don’t have, they will usually by it if I ask them too. In my area, the best place to purchase used books is at a “Friends of the Library” sale. These are used books that are donated by patrons to help raise money to support the library. Each branch has a huge sale a few times each year. The prices are rock bottom and the selection is usually very good. Check with your local library. You can also check booksalefinder.com for similar sales in your area. I buy my son tons of books from children’s consignment shops. I buy the majority of my children’s clothes from here and I always stop in the books section before I check out. I’ve gotten a lot of great books from here and they usually only cost around a dollar, and that’s for hardcover books too! Growing up, my local library used to have bag sales- they’d give you a paper bag and you could fill it up with as many books as you could fit in it for $1 or $2.. and let me tell you, you can fit a TON of books in a paperbag!! My local library has books for sale, but they’re 50c to $1 each- still not bad, but nothing like my old library! I love thriftbooks.com. Free shipping! And I’ve been happy with the speed of shipment. I also download a lot of free books to my Kindle, thanks to MSM, another free group I’m a member of and then the Amazon free list. Apparently, my library is now offering free kindle downloads also, but I have yet to sign up. Half.com is another good place (most of the time). I love find books for my toddler at the thrift store. The one near me isn’t great with its selection of anything but I can sometimes find books for 5-25 cents. 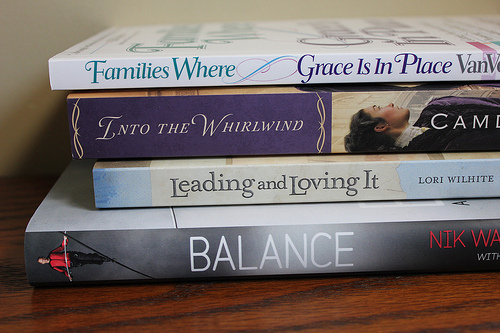 Adding: I get most of the books for myself for free through blog review programs through Thomas Nelson and Bethany House. Library sales are a great one to hit, too! Our local library was getting rid of some old books, and we found some great fiction for super cheap (1 bag full of books for a “donation”). I have used half.com and betterworldbooks.com to buy used. I always check the book sale table at the library where they sell used books for a nickle! I was surprised Half.com wasn’t on the list. It’s a great place to buy books at a huge discount! We buy books at thrift stores primarily. You do have to find the right one. We often read and then take them back to the store since our favorite store supports a women’s shelter. I usually don’t pay more than 25 cents or a book. I buy most of my books at http://www.thriftbooks.com they are also available through amazon. They have free shipping and many books start at 3.95. I have also purchased many of our home schooling books through thriftbooks, they have a ton of Childhood of Famous American titles to choose from. Don’t forget the library and if your local library doesn’t have the book you want, try the inter-library loan system. I’ve had great success with that! I love inter-library loan! Especially since I live in a small town! I also love ereadergirl.com! Best new website ever! I love my library! But my town no longer pays the neighboring town to use their library so I have to pay $25/year. Doesn’t sound like a lot but it comes due at that time of year where I barely have grocery money let alone extra money. Hoping to budget better for it next year. Alibris is a site just for buying used books. We’ve had good luck finding out of print books there. I’ve also bought used books on Half.com ( I found a set of American Girl books there in like-new condition for 1/3 the price of new ones). I’ve ran into a few great books at our thrift stores (classics). I’ve found several books at garage sales. I have several specific books on my garage sale list and I found quite a few earlier this year at a neighborhood garage sale. I bought hardcover, like new books of books on my list for $2 each. I also found some like-new board books for .50 for 4. I use Amazon for used books as well. We prefer hardcover editions whenever possible as they last longer, and we have a lot of people who will be reading and re-reading favorites at our house. I’ve bought hardcover editions and library binding (also hardcover) books for less than a new paperback, and they were in excellent condition. Getting books from the Library is a great idea but sometimes I will go all week without reading. I’m not a fast reader, work full time and with grandkids, kids and my elder parents in town time is limited. Could take me several weeks to a month to finish a book. That’s why I get most of mine from thrify stores, dollar tree or ebay. Then donate or sale the ones I don’t want. My kids used the library alot and now the grandkids go every week too. I found too many books at the local thrift shops when getting clothes. Now I shop the consignment store instead so I don’t have to walk by any books. I often buy book books at the farmer’s markets. I can often get books 3 for a dollar. I also sometimes sell old books there and get cash to buy more books with. I got almost all of Anne Rule’s books for a couple of pennies that way. When my kids were younger I belonged to a mother’s group (we had monthly meetings, organized playgroups etc.) and several times we organized a book exchange. Bring your books you’ve already read and no longer want, and pick up new (used) books from your friends. That might work great for kids books too, assuming wear and tear is minimal. Limitless resources from some great people. Many towns also have used book stores. Not only a great resource for books on the cheap, but they have trade programs. There was a Book Rack in my previous hometown which is a chain, but many towns have independent stores. Many areas also have seasonal kids’ consignment sales. The prices do vary since they are set by the seller, but I have found great books there. I check out print and ebooks from my library reguarly. Lastly – check out TUEBL.ca The Ultimate Ebook Library. Tons of ebooks for free. – A Celebration of Women Writers (http://digital.library.upenn.edu/women). I always check dealoz.com first. They compare prices for you. When my children were in parochial high school, we were responsible for buying their textbooks. I have saved THOUSANDS of dollars in nine years, buying used books. Our parents’ group sponsored a used book sale annually. Then I’d hit the online search engines–my favorites are campusbooks.com and allbookstores.com. These sites search multiple booksellers, including amazon, half.com, alibris, and many others, and show you who has the best prices. Also, our state legislature passed a law five years ago, requiring colleges to provide the ISBN number for all textbooks on course book lists. It makes getting the correct edition so much easier! My son is now in a paramedic program, and last fall the college bookstore wanted $584 for his books. We bought them used for $260. In Nashville we have a FABULOUS used bookstore called McKays. Seriously amazing. They have bestsellers often for 15-50 cents a piece. I love buying those! Oh wow!! Those are *killer* deals! A lot of books through that site. We’ve been selling our books and buying used for several years now. We have great libraries, too, but for homeschooling I really like to have the books right here in the house. I found a beautiful oversized art book with lots and lots of pages of paintings, many of which we will use in our art studies for several years to come, for $3.00 at a library “Friends of the Library” book sale. I just can’t say enough about used books.